Some eight months after the Galaxy S6 launched, it looks like Samsung's next flagship smartphone is already coming together and the possibility of a early January 2016 release appears increasingly realistic! Following a fairly convincing streak of leaks, industry sources claim that, come December, Samsung will be ready to put its new Exynos 8890 mobile SoC in mass production. This is the chipset expected to power some variants of the upcoming smartphone, while others will run on the Snapdragon 820 SoC, designed by Qualcomm and also manufactured by Samsung. Notably, the Exynos 8890 will be the first Samsung SoC to employ custom CPU cores, code-named "M1". 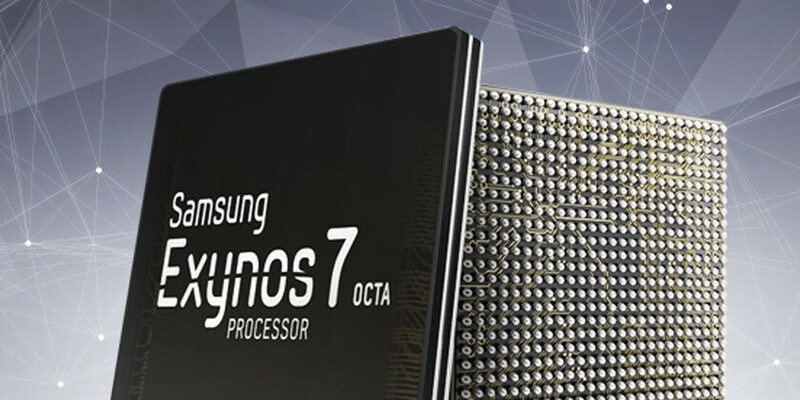 Although Samsung was accustomed to licensing standard ARM designs for its Exynos chipsets, it had custom core designs in parallel development for some time. That's the thing to do if you are a high-profile silicon slinger and want to make the most of the available semiconductor technology. Apple and Qualcomm built quite a reputation in the business, for their custom core designs (which basically optimize the heck out of ARM's work) facilitated fast and efficient processors, such as the Apple A9 in the iPhone 6s, or the Snapdragon 801 and 805 chipsets from 2014 that hold up remarkably well. Being an ambitious chipmaker, it makes sense for Samsung to pursue the same path. Right now, the company is busy testing and finalizing the Exynos 8890, while simultaneously working to bring the best out of the Qualcomm Snapdragon 820 in time for the Galaxy S7's release. Unlike this year, which saw Samsung abandon Qualcomm chips for its own Exynos SoCs, Samsung will have a genuine business interest in shipping as many Snapdragon 820-powered Galaxy flagships as possible over the next year, for Qualcomm has become a large manufacturing client of its. Thus, Samsung is said to be hard at work optimizing the chipset for its upcoming smartphone. However, industry murmurs claim that Samsung is battling the same overheating issues that plague the Snapdragon 810 SoC, but we have no way of verifying this information. One report says that Samsung is working on a software workaround and considering a "radiating pipe" cooling solution that would help draw the heat out of the chip. Either way, Samsung will be using its 14nm FinFET process in manufacturing the chipset, which is also said to offer 40% faster graphics performance and 40% less battery consumption than the Snapdragon 810 chip, which was built by TSMC on a 20nm process. At the same time, Samsung also needs to turn the Exynos 8890 into a solid, stable product if it hopes to compete with it in the Chinese market, where low-cost solutions from MediaTek, Huawei, and Spreadtrum reign supreme. The chipset contains an octa-core CPU with a maximum clock speed of 2.4GHz, and posted stellar preliminary benchmark results. Time to slay some (Snap)dragons! let the THY KING SOC cometh...MONGOOSE!!!!! what people here are forgetting is that despite snapdragon being slower(sometimes) packs a mighty punch when it comes to features, and has a beastly gpu which enables many features like capturing 240fps slow mo videos and drives the games. The GPU in snapdragons isn't stellar I should say. Gaming fps is always slower than on Exynos/Mali or even Mediatek/PVR and video encoding is a job for an ISP, the GPU has nothing to do here. Well duh. Beating a 6 month old chip is nothing to be proud of. 5410 < A7 < 5422 < A8 < 7420 < A9 < 8890 ................. A newer chip will always be better. But Hut wasn't the multicore score better on the 7420? And wouldn't the GPU perform better if it was just pushing 1080p like on the 6s+? Yes, the multicore is better. No, the GPU will still be way slower even at 1080p. The A9 has about 60% more power in 1080p off-screen. Not 60% but about 40% performance advantage is a very-very good margain for Apple's PowerVR. No, the GPU is significantly slower even at 1080p. But the iPhone 6S models aren't 6 months old yet. Not the same when comparing the A9 to the 7420. Even though the iPhone certainly had better benchmarks, those mean nothing vs day to day phone activity. Still takes crappie photos, still handles one app at a time and it still doesn't carry a bunch of features. Also not saying it had too. What I am saying is a 200lb man can run faster than a 400lb one, but that doesn't make him better. It just makes him faster. If Samsung was smart, they wouldn't use anything with Snapdragon in the name. 99% of the potential buyers of the S7 have never heard of qualcomm or snap dragon. Us forum dwellers are the small .5%. If that. I know we think we are a big population. But we aren't. We are tech nerds. Not ever the cool type of tech nerds. Very valid point. They'll still get the sales but will get patronized on here for burning people because the processor overheats, causing massive amounts of iTards to troll anything that's not Apple. At the end of the day, I'm looking forward to the foldable phones the most. yeah, but we feel things should be made with us in mind since we are the ones that actually care. I understand that's not how it is, just saying. Do this Exynos has built-in malware protection? The same advanced Camera stuff? OR same integrated LTE modem? Nope its wont. its may be faster in benchmark but on a sd400 right now i dont have lag in any games so soc are too fast for nothing. You can easily use CM on an Exynos device.I have a Galaxy S4 and I have been using CM for several months,works great.Updates and come almost every month.All I can say is I am completely happy buying an exynos device. Nobody cares*** *** and couple of nerds who care about it are irrlevant for marketing discussions. You're on the wrong site to be putting down nerds. A lot of what's said in comments is irrelevant for marketying discussions. You going to be commenting on every one? I have absolutely no reason to use CM on a Samsung flagship. First, they're always buggy. Second, I'd lose functionality that I bought the device for, like the S-pen. Not that I have any choice, being on Verizon. My Note 4 still doesn't have permanent root, let alone a bootloader unlock. I don't expect the Note 5 I bought to ever get it, either. Using CM on a Samsung device (especially Note series) seems to be unlogical. My sister's G4 is laggy as hell now. She even switched back to samsung s6 edge+ after that. Seeing how the 8 month old S6 camera was still beating the iPhone 6S, I say YES. As far as malware protection? Way back in 2012/2013 there was some claimed exploited that could root Exynos at the hardware level and attack the hardware, but not became of it... Samsung has the fastest LTE model that I am aware of.